Activists have descended on Parliament House, taking over the public foyer with a sit-in to protest the Adani coal mine. More than 30 parliamentary security guards and Australian Federal Police surrounded the protesters to monitor the situation on Wednesday morning. The protesters were given minutes to leave or they were told they'd be escorted out by security. Greens Senators Sarah Hanson-Young and Jordan Steele-John arrived in the foyer to back the activists, who were holding a "stop Adani coal mine, our futures on the line" sign. There were more than 40 activists attending the sit-in which started just after 11am and was disrupted about an hour later. "When are futures are under attack, what do we do? Stand up, fight back" the group chanted. Officers with a police dog also arrived to monitor the protesters. Crossbenchers Julia Banks and Kerryn Phelps attended to listen to the activists. 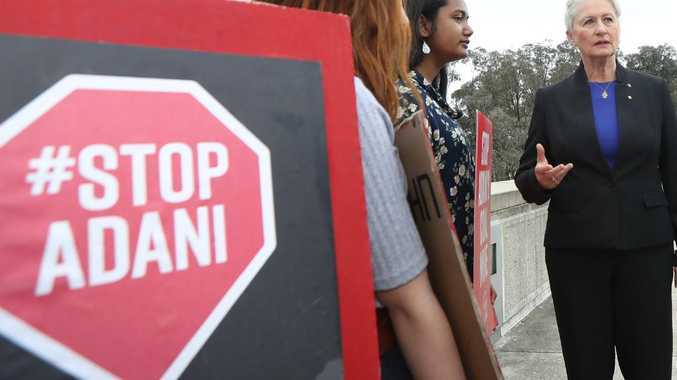 The group slammed Prime Minister Scott Morrison for refusing to meet them but also blasted Opposition leader Bill Shorten for being "on the fence" when it came to the Adani coal mine. 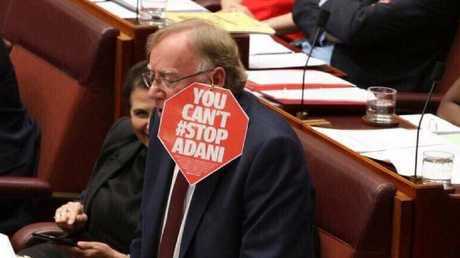 LNP Senator Ian Macdonald with a giant You Can't Stop Adani earring in parliament. Earring was made out of a laminated front page of the Townsville Bulletin. Picture: News Corp Australia. 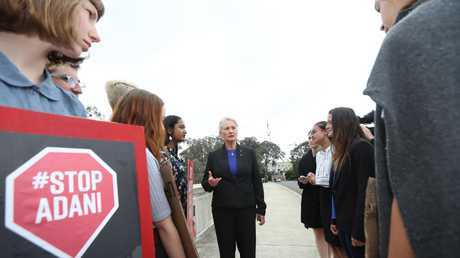 The protest comes days after thousands of students descended on their local parliament buildings across Australia in a push to get the government to act on climate change. One of their main directives was to stop the Adani coal mine plans in Queensland.